The 18-hole Volcano Golf & Country Club in Volcano National Park, HI is a semi-private golf course that opened in 1920. Designed by Jack Snyder, Volcano Golf & Country Club measures 6503 yards from the longest tees and has a slope rating of 128 and a 70.4 USGA rating. We had a great time on this course. Weather was perfect. Greens were great. Lost a lot of balls in the brush - but we had a fantastic time. 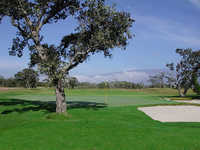 Best priced green fees on the island. Play is fast, less than 3 1/2 hours, if not stuck behind a six some. Nice & cool temperatures, greens pretty good, fairways good , ball almost always sits up in fairway. Must hit straight or you may lose balls in the forest. Sand traps lack sand. Scenery is magnificent especially during winter months with snow on Mauna Kea & Mauna Loa mountains and sun shinning with blue skies. A nice track and worth playing if you are in the area. The course conditions were average but very playable.